I have loved Jana Reinhardt's 'Simply Sweet Jewellery' for a few years now, when I was introduced to The Sleepy Fox ring at a press day. 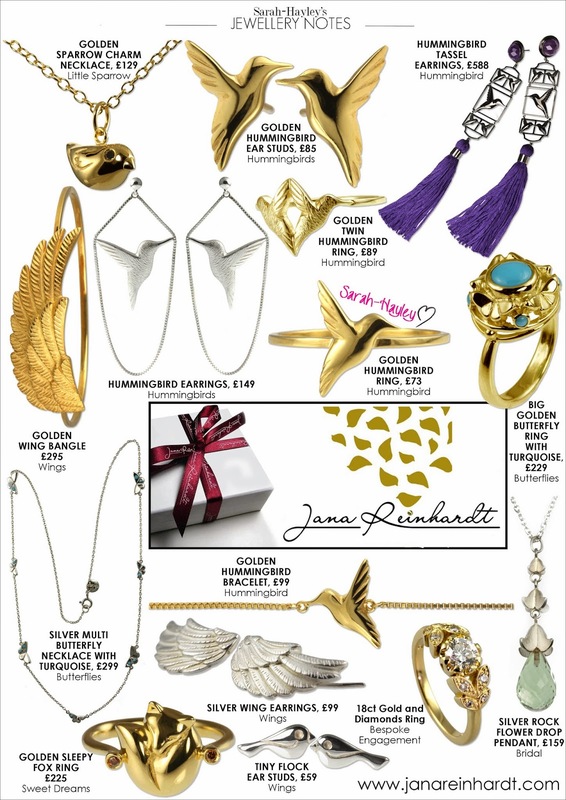 The latest collection by Jana and her husband Ross is utterly gorgeous too and it focuses on the magical hummingbird. On family holidays to Virgina, USA, I would sit in wonder watching these pretty little birds, waiting patiently with my camera hoping to snap one. My favourite piece is the single hummingbird ring, simple and sweet, it is an everyday wearable ring. I have also included favourites from other collections. The Golden Wing Bangle is a striking piece and also the latest addition to the Wings collection. All collections are inspired by Jana's childhood seeing the wildlife in the countryside. It is this I can relate too, as I grew up and live (part time) in the astonishing beauty of The Cotswold's. I especially admire that all pieces at Jana Reinhardt are made entirely by hand, using the traditional method of wax carving, thus creating a unique piece of jewellery every time! You can find Jana Reinhardt in many boutiques and jewellery stores up and down the country, although you can buy everything from their online boutique.